Bangsar getting a little too commercial? A lot of you would have this question in mind, especially with the latest news about traffic nightmares in and around Bangsar. Everyone knows that coming to Bangsar and hunting for a parking lot around Telawi area is like a form of gambling in itself. Apart from the massive traffic of cars running through the roads trying to get from Point A to Point B, people doing illegal parking and double parking along the streets really does not help the situation. 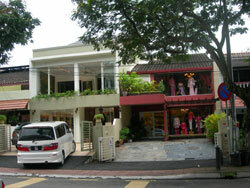 This situation has steadily grew in the past years as Bangsar becomes more and more developed as a Business Center. With the opening of Bangsar Village and soon to be Bangsar Village II, you can be rest assured that even more traffic would ply the streets of Bangsar. Of course the conversion of houses facing Telawi from residential to commercial status does not help the traffic situation. It is said that there are 55 houses along Jalan Telawi of which 10 are operating as businesses. Whether it is legal or illegal, the question now is City Hall should come up with a decision about the status of properties here. Bangsar’s popularity is definitely growing and many people know that. Take Naza for example, it managed to pick a prime spot of land opposite TMC on Jalan Ara, which gives it an edge by having a Billboard Building showcasing all the latest cars in the market. Lets just hope people will not slow their cars down to admire the cars in the glass encased showroom. City Hall should stop converting residential property into commercial lots until they finalise the status of properties. As already, traffic is so chaotic, especially during lunch and evening hours when everyone does their running around to run their last minute errands or where outgoing traffic clashes with incoming traffic. City Hall has been unable to control it but all it boils down to is proper enforcement. 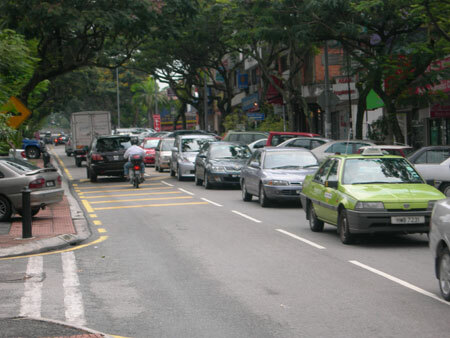 If cars are not allowed to stop in yellow lines, illegally park or creating bottlenecks on the roads, plus provide the availability of cheap and affordable parking, traffic problems in Bangsar would bound to improve. Once Bangsar Village II opens in end December or early January, we sincerely hope car owners will move their cars over to the multistory underground car park. Reasons of distance to walk should no longer be an issue. Lets hope the parking rate is kept to an affordable range. 4/2/2009 11:18:06 PM Voice1 I think it the worst of all is the self appointed jockey parking services! It is outrageous for residents who wants to just pop in the shop and take out some food! Over and over some one write a complaint to the press. But nothing is done to the gangster type jockey threatening people for money. They demand RM10 or else.... why aren't the police doing something about this? 12/21/2006 10:47:38 AM 1296 lets turn the new shopping complex to parking complex. we have enough shopping place in bangsar already, and midvalley is not far. lets make bangsar a place for clubbing and food only.